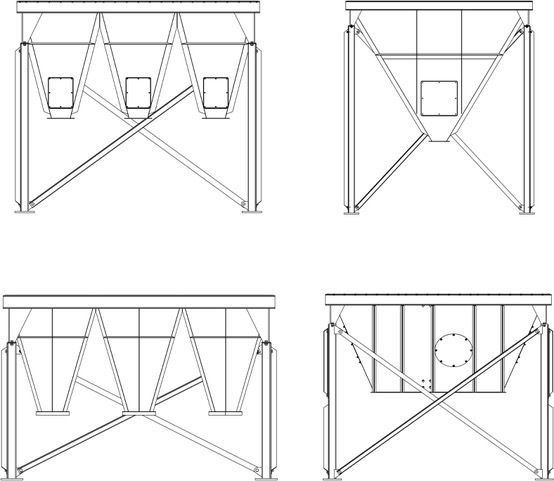 Variations in hopper outlet configurations should be considered when designing a dust collection system. Inlet dust loading, dust characteristics, discharge devices, and hazard mitigation strategies may lead to one design over another. If you plan to purchase or upgrade your facility’s dust collection system, there are many factors to consider about the process you’re trying to control. With a variety of filtration media and equipment models to choose from, it can be a bewildering process. Here are a few considerations to guide you toward an appropriate dust collector for your facility. Is your dust a fine particulate or bulky and abrasive? Density and dust characteristics heavily impact the filtration technology you choose. Next, identify whether it’s hazardous or combustible. Get lab testing if you’re not sure, and know the industry standards and local codes that apply to you. Depending on your contaminant and process hazard analysis, regulations may dictate a collector style, size, physical location, and hazard mitigation equipment necessary for your process. Toxic or corrosive dust—salt, for example—may require modifications to equipment, such as chemical resistant coatings, epoxy paint, or stainless steel components. Identify where the nuisance dust is produced. If it’s a single bag dump station, locating a point-of-use dust collector next to the equipment may be a viable option. If you have a large-scale material handling process that generates a significant volume of dust along many points, a centralized dust collector located outside of your facility may be more appropriate. Estimate the quantity of material you’re generating—whether in pounds per day or cubic feet per shift. Your manufacturer will convert this data into grains per cubic foot, the measurement that determines your dust loading demands. Volume plays a huge role in driving dust collector model, size, and relative ancillary equipment. How frequently your process generates dust could affect your dust collection choice. For example, if you have a bag dumping station where an employee empties a bag of material every two hours, an intermittent-duty dust collector may serve you well. If your application generates dust continually, or operates 24 hours a day, a continuous-duty dust collector would be a better option. Likewise, multiple individual stations operating at the same time may be handled better by one large dust collection system rather than several smaller, individual units. What are your production demands, and can you afford to be down for unexpected maintenance? If your process is critical and requires operation around the clock, or you have dedicated maintenance periods every few months, set that expectation upfront. This may mean sizing your dust collector conservatively—a larger model with more filters—so you can reduce downtime and maintenance costs. Lost production costs may justify a larger capital investment. • Cartridge: For finer particulates that demand a high-efficiency media and continuous operation. These versatile collectors can be used for centralized or point-of-use applications and can be located either indoors or outdoors. Continuous-duty cartridge-style dust collectors require compressed air for pulse-jet cleaning. • Baghouse: Used for high-loading, high-volume applications. The fabric media of a baghouse collector is more conducive to challenging applications, such as high temperatures, moisture, and chemical resistance. This larger equipment is usually located outdoors, and comes in a variety of cleaning mechanisms: positive displacement pumps, compressed air, or reverse air technology. • Fluted Media Collectors: High-efficiency media in a fluted configuration. This technology is ideal for point-of-use dust collection needs, where a compact design and easy maintenance are necessary. A hybrid recently introduced to the market is pleated filter bags. Utilizing cartridge media, these filters are configured to function in a baghouse dust collector. If cartridge technology is necessary for your dust type, but your space or dust volume are more conducive to a baghouse, this hybrid may be a solution for you. These types of collectors need to be shut down in order to clean the filters. They are ideal for low-volume and light-loading applications, and most operate using a shaker-style cleaning mechanism. This equipment is an energy-saving compromise between intermittent-duty and continuous-duty dust collectors. VFDs manage fan motor speed so that the fan only uses as much or as little power as needed. If your application has periods of lighter dust generation that requires less airflow, a VFD is a good option compared to turning on and off your fan, which can impact fan performance. With each dust collection equipment technology, there are typically several filter media options available. Selecting the appropriate filter media can be just as important as the equipment technology. You can choose from high-performance fine fiber media, standard media (usually felt or cellulose), or other specialty media. Fine fiber or spunbond media is better suited for submicron particulate than commodity media, such as polyester felt or cellulose. Specialty media, such as aramid or PTFE membrane, is recommended for high-temperature applications or effective dust cake release during pulse cleaning. With the chosen (or required) technology in mind, it’s important to think about how the dust collection system will best fit into your facility and what accommodations you need to make for its operation. Where you locate your dust collector depends on the nature and volume of your contaminant. A process hazard analysis may dictate where the equipment is located—inside or outside your facility. Depending on the contaminant you want to control, options such as recirculating clean air to the facility and certain ancillary equipment may not be feasible. Also, if it’s a powder susceptible to moisture, you’ll want to avoid exposure to changes in temperature, as that could cause condensation. Temperature fluctuations, especially in spring and fall, may alter the dust properties, in which case the best solution may be an indoor collector using conditioned air to keep the product dry and free-flowing. Once you’ve determined where your dust collector will go, there are frequently options or configurations available to fit your facility. The most common is a dust collector with a filter housing on top and a hopper underneath. However, modifications such as hopper design are typically offered to better suit your process needs. For example, you could have individual hoppers leading to 55-gal drums for discharge, or a trough-style hopper with a screw conveyor and a single discharge point (see Illustration 2). Remember that what goes into the dust collector has to come out, so be sure to size discharge devices accordingly. In addition to the volume of material, take into account dust characteristics, such as fibrous or agglomerative material. The nature of the dust may lead to modifications of the dust collection equipment or discharge devices in order to avoid product building up in your collector. When reviewing hazard mitigation equipment, such as an NFPA rated airlock, it’s important to check with the vendor to ensure that it’s appropriate for the dust you’re collecting. Space constraints are not the problem they used to be. Most collectors on the market are built in a modular design that allows for a solution for nearly any footprint. Cartridge collectors, for example, can be sized tall and narrow, or short and wide—to avoid overhead cranes or nearby equipment. Outdoor baghouses, which are typically larger in size, can be rectangular in design to fit more closely along your building, or they can be round, fitting into a designated area. For a pulse-cleaned collector, you’ll need a dryer and compressor-sized appropriately to meet the compressed air requirements for the dust collector. Alternatives to compressed air include positive displacement pumps for baghouses, or intermittent-duty collectors that use a shaker-style cleaning mechanism. As mentioned earlier, a hybrid option is utilizing pleated filter bags in a baghouse, with a positive displacement pump for cleaning. This provides the benefit of cartridge technology, without the expense of compressed air for cleaning. As you’re assessing your facility, remember to take note of the existing power supply. There can be installation havoc if you have a mismatch between the control panel and/or motor voltages on your new equipment, and the power supply in your facility. Verifying this ahead of time avoids last-minute rework from an electrician or a control panel vendor during installation. • Energy costs: Compressed air consumption and fan horsepower will impact your energy costs during operation. Using on-demand cleaning or a VFD can help to reduce these costs. • Replacement filter costs: How frequently will you need to replace filters and what is the cost for a full-set of replacement filters? Commodity media may have a lower price point, but often results in more frequent filter changes. • Downtime costs: If your process is down due to filter changes or other maintenance, what is the impact to your business? Can you afford unexpected downtime? Having a spare set of filters or common replacement parts on-hand may help reduce downtime costs. If your process is critical and requires 24/7 operation, you want the longest filter life possible. You can prolong filter life by increasing the size of your equipment. More media results in a lower filtration velocity, which leads to lower pressure differential across the media, less frequent cleaning and compressed air consumption, and longer filter life. For larger baghouses with hundreds of filters, the installation of shorter pleated filter bags reduces downtime and labor costs when compared to the traditional felt bag and cage configuration. Installation of a dust collection system can also bring about additional costs. Work with your dust collection manufacturer to understand what equipment and tools will be required for your purchase. For example, a crane may be necessary to erect a large baghouse, or a certified electrician may need to be present for wiring electrical components. It is also helpful to have a spare set of filters on hand in case unexpected issues arise once the equipment is installed. Dust collection is critical to your operation and has many moving parts—especially in the decision stage. Incorporating these considerations into the purchasing process will ensure you walk away with a more appropriate and efficiently sized dust collection system. Chrissy Klocker is applications engineering manager with the Torit Div. of Donaldson Company, Inc. For the past four years, she has instructed at the Industrial Ventilation Conference in Lansing, MI, where she also serves on the conference planning committee. Klocker holds a B.S. in Civil Engineering from North Dakota State University and a Master’s of Business Communication from the University of St. Thomas in St. Paul, MN. For more information, visit www.donaldson.com.